Boasting 323 luxurious guestrooms and suites, the Condado Vanderbilt Hotel accommodations highlight the hotel's captivating oceanfront setting. Following a meticulous renovation, the architectural and interior designs of this historic San Juan Puerto Rico hotel have been restored to its original 1919 grandeur. With a devotion to attentive yet intuitively discreet service, the Condado Vanderbilt immerses guests in an experience that is simply unmatched. 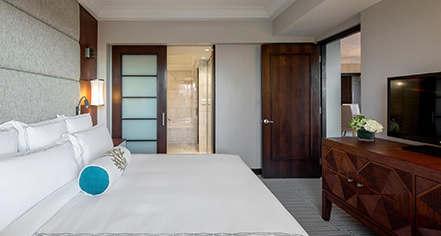 Every detail of the elegant accommodations have been conceived to reflect the beauty and serenity of the Puerto Rico coast, from elegant design elements to French windows and doors that blur the distinction between indoors and out. Private balconies and terraces invite guests to enjoy the splendor of the Atlantic Ocean in solitude and revel in the sheer indulgence of the breathtaking surroundings. 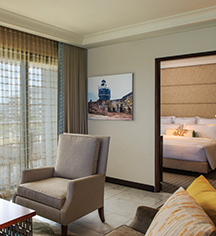 Guestrooms - A variety of sophisticated accommodations boasting spectacular ocean views and carefully selected furnishings and appointments. Suites - Boasting spacious living areas, kitchenettes, and grand bedrooms, suites offer additional amenities to ensure the comfort of every guest.